The Run for 102 / Run for the Roses 5K and 1-Mile Fun Run have joined together for one great race! 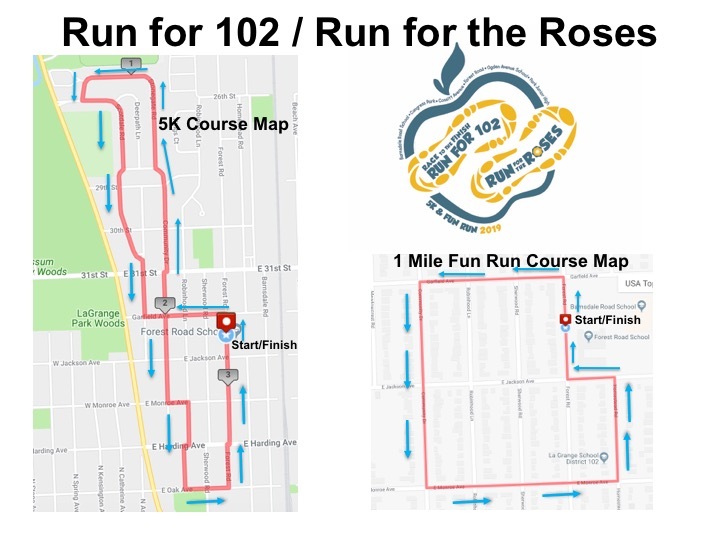 The Run for 102 benefits the PTO/PTCs for the six schools in District 102: Barnsdale Road School, Congress Park Elementary School, Cossitt Avenue Elementary School, Forest Road Elementary School, Ogden Avenue Elementary School and Park Junior High. The Run for the Roses benefits the LaGrange Park Community. The 5K event is open to everyone. The 1-mile event registration is only open to kindergarten through 8th graders. Parents, for the 1-mile event you can join with your child to help him/her if you feel it is necessary. If you wish to help your child in the 1-mile event, you will not be timed and do not need to register yourself, you can just run/walk alongside your child during the race. The Run for 102/Run uses a disposable chip timing tag that runners receive at packet pick up on their race bibs. It is lightweight and remains attached to the race bib. Runners must wear their race bibs on the front of their clothing (preferably chest) in order to be timed accurately. There is no post race chip turn-in or fee for lost or unreturned chips. Gemini Gymnastics, 330 Washington Ave, La Grange. Friday, May 17th, 12:00-6:00 pm and Saturday May 18th 10:00am-4:00pm. Race day registration and packet pickup opens at 6:45am and closes at 7:45 am.